Prof. B. Jayakumar, Head, Dept. of Internal Medicine; Chief, Division of Endocrinologogy & Diabetology, Medical College Hospital; Fellow, Diabetes Centre, Karolinska Institutet; Coordinator for the Linnaeus-Palme programme at TMC. Prof. K.T. Shenoy, Dean, Faculty of Medicine, University of Kerala; Head, Dept. of Gastroenterology, Sree Gokulam Medical College & Research Foundation; and Executive Director, Population Health and Research Institute; former Course Coordinator of Global Medicine Course. Dr. K.B. Leena, Research Scientist and Co-ordinator, Population Health and Research Institute. Prof. K.T. 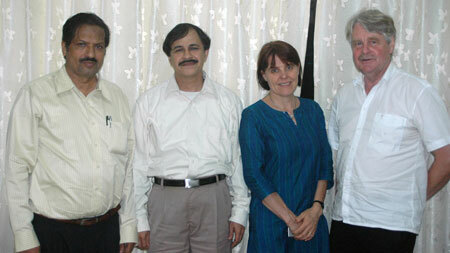 Shenoy, Prof. B. Jayakumar, Anna Lindberg and Lars Eklund. 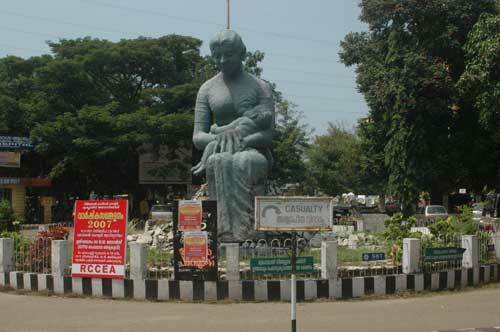 We visited Trivandrum Medical College (TMC) in Thiruvavanthapuram on what turned out to be Diwali Day, an Indian national holiday, less celebrated in Kerala than in north India but even so a holiday. In spite of this, our hosts at TMC, professors Jayakumar and Shenoy, were kind enough to arrange for a meeting at the Principal’s office to talk about the long and successful Indo-Swedish collaboration that TMC is involved in. A long-standing relationship exists between Karolinska Institutet (KI) in Stockholm, and TMC from its inception in 1951, when the Swedish professor Axel Höjer became the first Principal for TMC (his portrait is hanging on the wall in the TMC auditorium, see above). Since TMC plays an important role in Karolinska Institutet’s India programme (within the framework of the Karolinska International and Training Programme, KIRT), we found it most interesting to learn more about this existing programme. It includes reciprocal exchange of students and teachers every year within the framework of the Linnaeus Palme exchange programme since 2001. This exchange involves several departments at KI, and the collaboration was further stabilised after a meeting between representatives of KI and the Chief Minister of Kerala was held in November 2004. It was then proposed that KI doctors should be sent for clinical courses/workshops and carry out the clinical part of KI’s postgraduate courses in TMC. A new International Office in TMC coordinates these activities as a single window clearance system. Another strong collaboration between KI and TMC are the courses in Global Health that has been running twice a year since 1996. The initiative originally came from Prof. Hans Rosling (photo to the right), at that time working at the Unit for International Child Health, Uppsala University but soon after changing over to the Division of International health (IHCAR), Department of Public Health Sciences at KI. As former Head of IHCAR, Prof. Bengt Höjer (Axel Höjer’s son) was also instrumental in realising the collaboration programme. Since then, More than 500 medical students from KI have received training in Global Health at TMC. Prof. Shenoy, recently retired after 29 years from his professorship at TMC (but instead promoted to become Dean of the Faculty of Medicine just a few days before our visit), and the person in charge of the collaboration from the start on the Indian side, informs us that the students coming to Kerala mostly has had a background in Medicine, Dentistry and Biomedicine, and they stay for two weeks. The next batch of students will come in January 2008. Finally, a number of individual research projects connect KI and TMC. • SASNET supported a research collaboration project on ”Pregnancy and Infancy in South Asia (PISA)” in 2003, a project led by Prof. Bo Lindblad, IHCAR, Ki, and Prof. K.T. Shenoy. The project also involved Stockholm University (Dept. of Social Anthropology and Dept. of Economics), and the Nordic School of Public Health (Epidemiology) in Göteborg, Aga Khan University in Pakistan, Christian Medical College and Hospital in Vellore, India, and The Population Council, United Nations, New York. It focused on pregnancy related morbidity and mortality, a major medical and economic problem in South Asia. More information about the project. • Professor Bengt Höjer has also been involved in a project on perinatal deaths, with Prof. K.T. Shenoy. A project focusing on the determinants for public health care seeking among pregnant women in a rural Kerala community. The same team made comparative studies in Vietnam and South Africa. • Prof. Shenoy has recently been involved in a project on ”Nonalcoholic fatty liver as a risk factor for the development of chronic liver disease and hepatocellular” with Prof. Rolf Hultcrantz at KI’s Gastroenterology and Hepatology Unit. The project, funded by the Swedish Research Links programme, is a comparative study of the impact of fatty liver on chronic liver disease (CLD) and Hepatocellular carcinoma (HCC) in two different areas with high (Kerala) and normal frequency of diabetes mellitus Type II, in Kerala and Sweden. • Earlier, during the 1990s, Prof. Shenoy worked together with Prof. Hans Rosling in a project on Cassava Toxicity, funded by WHO and Sida/SAREC. The Global Health course was a side effect of their collaboration. • Right now, Prof. Shenoy is anxiously waiting to know the outcome of the application for a major research project titled ”Novel Resistance Genes against HIV-1”, to be funded by EU’s 7th Framework Programme (the decisions are expected during November 2007). The project, planned for in collaboration with Dr. Anna-Lena Spetz at the Center for Infectious Medicine (CIM), KI, deals with the ability of human cells to recognize infectious agents, how cells behave and adapt to drugs. Besides Karolinska Institutet and Prof. Shenoy’s Population Health and Research Institute (more information below), the project also involves one university in Spain and the Bose Institute in Kolkata, India. • Prof. B Jayakumar is involved in an Indo-Swedish research collaboration project, on Diabetes with Dr. Sanjeevi Carani at the Molecular Immunogenetics Unit, Center for Molecular Medicine (CMM), KI. • Prof. T. Sheela Shenoy, Head of the Obstetrics Department at SAT Hospital, Thiruvananthapuram (and wife of Prof. K.T. Shenoy), is also involved in research collaboration with KI. She is working on a project titled ”A randomised controlled trial on the effect of Acupuncture on labour pains”, together with Dr. Anna Hjelmström and Prof. Ulla Waldenström, Dept. of Woman and Child Health, KI. Prof. K.T. Shenoy was overwhelmingly positive towards our SASNET visit. Even though TMC already has an existing successful collaboration with KI in several different ways, he thinks that other Swedish universities are also welcome to establish collaboration projects with TMC. As newly appointed Dean of the Faculty of Medicine, University of Kerala, he argues that right now its is a great time to develop new link programmes. Currently the university is going to change its system of courses, and introduce the semester/credits system like in Europe. Therefore it is the right time to work on new programmes and courses in collaboration with Swedish universities. Regarding this, Prof. Shenoy also mentioned the importance of the Indo-Swedish MoU on Biotechnology and Science that was signed in 2006. 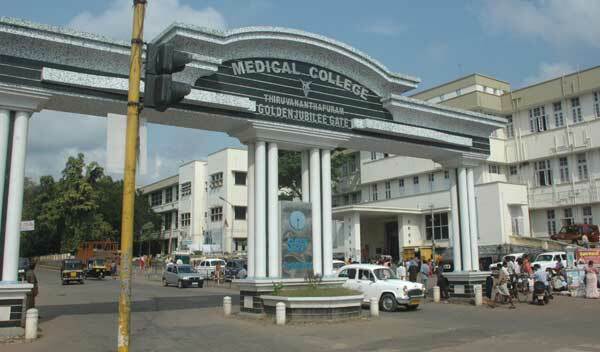 It may well apply to any of the nine medical colleges that are part of the University of Kerala. After our meeting at the TMC Principal’s office, Prof. Shenoy drove us around the TMC campus, and we visited the auditorium with its portraits of former Principals. 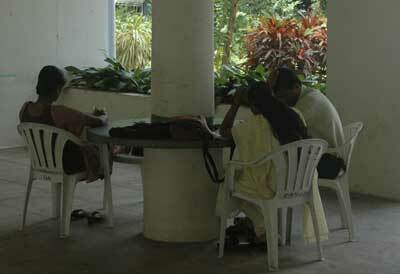 Even though it was Diwali day, a number of medical students were present at the college, studying (photo above). From the TMC we went to the Population Health and Research Institute, run by Prof. Shenoy and colleagues, among them Dr. K.B. Leena (photo to the right). The institute is doing good work on research concerning tobacco and its health hazards. In collaboration with scientists from Cuba, South Africa and Russia, and with funding from the WHO, and UK, the institute is involved in a study of 400 000 people, mixed tobacco smokers and non-users, in the district of Trivandrum, Kerala. Dr. Leena is the research coordinator for this project that will go on for 17 years (it began in the year 2000). The analysis work is all done in the lab in Thiruvantapuram, and the records are also kept here. An impressive work indeed. Dr. Leena has also a connection to Karolinska Institutet. She is planning for a project to study the beneficial effects of the Indian plant Salacia peronides, that could be used to prevent diabetes. This project is planned together with Prof. Claes-Göran Östensson, Department of Endocrinology, Metabolism and Diabetes, KI.